Students at Rosary College in River Forest were finding a better way to learn a foreign language today. They were being introduced to the school’s new language laboratory. Nobody is sure when or where the first language lab opened. As early as 1947, the University of Toronto was using recordings to help students in French class. The concept was still new in 1954. Rosary’s lab was the special project of its president, Sister Mary Timothea. Her European travels convinced her that more Americans needed to learn a second language. Part of the problem was the way foreign languages were taught. College language courses had always stressed grammar and reading. That wasn’t good enough. American students should learn how to actually speak the language they were studying. It was important to hear native speakers—German people speaking German, Spanish people speaking Spanish, and so on. One way to do this was to study abroad. Rosary had a program where juniors could spend a year in Switzerland. But the $2,700 price tag was too expensive for many young women. The Rosary Language Lab was an alternative. 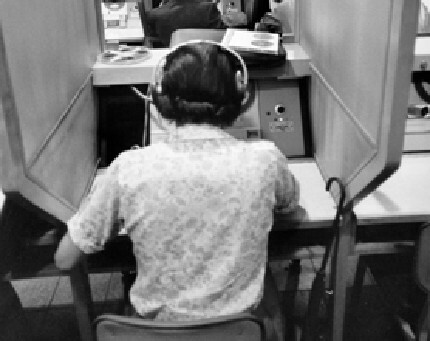 Each student in the lab had her own set of earphones to access any of five languages. She could listen to recordings in the language or monitor short-wave radio broadcasts. Some lessons were linked to the textbook. That way, the student could hear the words spoken as she read her assignment. All the lessons were recorded by native speakers, or by faculty who had been trained abroad. Students were also able to record their own speaking. Then they could help each other work on their accents. The lab was getting much local attention. Already 65 children from five area grade schools were using the facility for after-school lessons. Rosary was also starting a six-week advanced summer workshop in French and Spanish. This was for high school language teachers who wanted to brush up on their skills. Today, advanced technology has transformed the scope of language labs. But the central idea—that students must actually hear native speakers—remains as important as it was in 1954. Rosary College has also changed with the times. 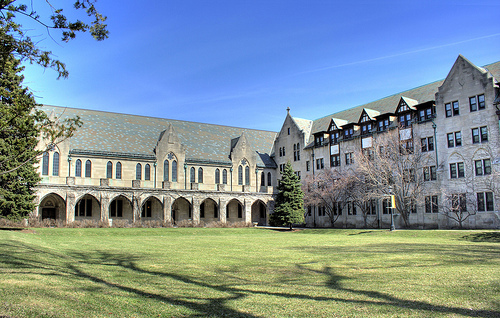 Still located in River Forest, it now has both female and male students, and is known as Dominican University.